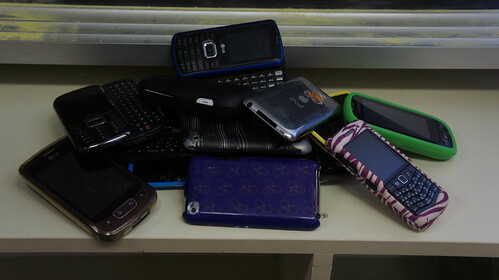 My students arranged their devices in a pile today when I shared the @dailyshoot topic of "Connection." We're working towards being connected at school. I was given permission to set up WiFi (connected to the school network) in my temporary portable during the first week of school this September, and so I've been able to get online for basic tasks the last couple of weeks. But our under-renovation main site will be supported with WiFi for school and student-carried devices. That's going to be a game changer. There's a lot of information management potential in that stack of devices. I am confident that our school and district policies will evolve over time to support the day-to-day use of handheld devices in our learning spaces. Soon we will be past the days of "checking in devices to the office at the beginning of day," and students will learn responsible use of their devices during the learning time. We'll all be in a much better position to maintain our connectedness to our world as we go about some real, authentic learning.